Phacoemulsification is an advanced form of cataract surgery involving a short recovery time. Using small incisions that typically do not require sutures, Dr. Sonny Goel can quickly and safely remove a clouded crystalline lens and replace it with an intraocular lens, restoring clear vision. To learn more about how phacoemulsificationperformed at our Annapolis, MD, practice can help you overcome cataracts and experience clearer vision, contact us today. Capable of vibrating up to 40,000 times per second, the phaco probe can quickly fragment the lens into fine particles. Using gentle suction, these particles are then removed through a small opening in the probe and replaced with an IOL. The incisions are so small and watertight that they typically do not require sutures. 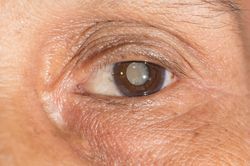 Phacoemulsification, often simply called phaco, is one of the most effective approaches to cataract surgery. Cataracts are a gradual clouding of the crystalline lens, which lays behind the cornea and plays an important role in focusing light on the retina. While patients can take measures to see clearly in spite of cataracts in the early stages, surgery eventually becomes necessary as vision is further compromised. Cataract surgery is one of the most commonly performed surgical procedures in the U.S. The crystalline lens is encased in a thin, flexible shell called a capsule. The difference between most cataract surgeries is the way in which the surgeon accesses and removes the lens from the capsule. Phacoemulsification involves using a computerized needle called a phaco probe, about the size of a ballpoint pen. Tiny incisions are made in both the cornea and capsule, allowing your surgeon to place the probe directly into the lens. Capable of vibrating up to 40,000 times per second, the phaco probe can quickly fragment the lens into fine particles. Using gentle suction, these particles are then removed through a small opening in the probe and replaced with an IOL. The incisions are so small and watertight that they typically do not require sutures. Following surgery, vision typically stabilizes completely within a few days, allowing you to return to your daily routine. The specific timeline of recovery varies from one patient to another. Patients wear a bandage over the treated eye for the first night. After the first night, an eye shield will be necessary to protect the eyes during sleep for at least a week afterward. While the full healing process can take several days to two weeks, many patients report clearer vision within a few hours of the surgery. You will undergo follow-up appointments with Dr. Goel the first two days after surgery to monitor your initial progress. Further follow-ups will be scheduled over the next several weeks. If you notice any compromise in vision, pain, or red eye, contact us immediately. Cataracts are a common condition that can take a serious toll on your quality of life. Fortunately, advanced methods such as phacoemulsification make permanently treating cataracts a safe, efficient, and effective process. Dr. Goel is passionate about using sophisticated techniques and technology to help his patients see the world around them in the best possible clarity. If you are experiencing cataract symptoms, or if you have been living with cataracts and feel ready to achieve permanently clearer vision, schedule a consultation today.